TMT 2015 Science Forum: “Maximizing Transformative Science with TMT”: 2015 June 23 - 25, Mayflower Renaissance Hotel Washington D.C. The annual Thirty Meter Telescope (TMT) Science Forum brings together members of the international community to meet, collaborate, and plan for future TMT science programs. The Forum is the premier opportunity to learn about the status of the observatory, its instrumentation and adaptive optics systems, and to get involved in shaping the future of TMT. 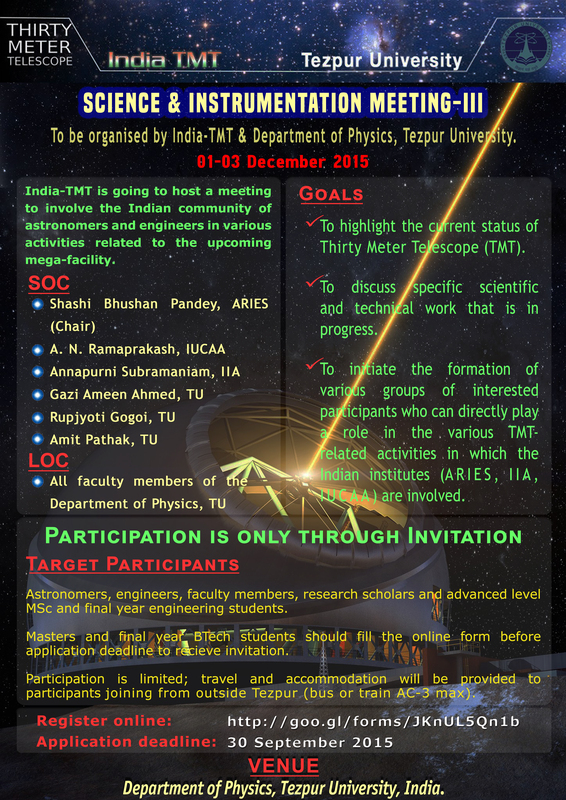 As a part of ongoing activities by India-TMT, it is proposed to host a meeting at ARIES, Nainital, during 05-06 November 2014, to update the present status of the project and discuss the scientific challenges and capabilities of TMT.